Wash and soak the avalakki/poha in curd/yogurt for 1 to 2 hours before grinding. Before turning on the grinder add little water, grind the soaked rice, urad dal and avalakki to a fine paste along with the soaked water (10 to 12 minutes). You may add more water only if needed. Transfer some of the soaked water to a bowl, grind the soaked ingredients to a fine batter. Add water when needed. We may need less water if we grind in the mixer. Transfer the dosa batter to a big container, add salt and mix it with hand which helps the batter to ferment well. Cover it and keep it near the stove OR warm the oven for 2 minutes and turn off the heat and keep this batter to ferment. Make sure the consistency of the batter should not be too thick or too thin batter, please watch the video for better look at the consistency. Add sugar to the fermented batter . Mix the fermented batter well . Flip it to the other side, cook it for few seconds. Put some oil on top. 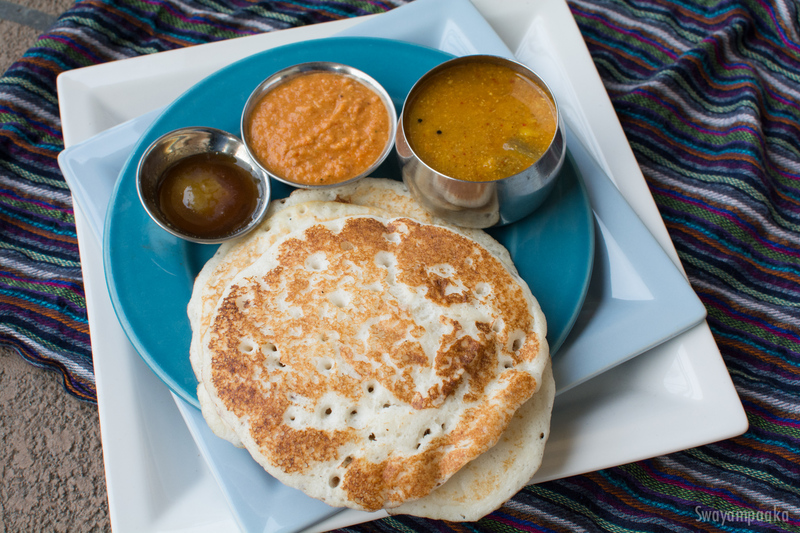 Once it is cooked on both sides remove the dosa onto a plate. Before making the next dosa, put the oil/ghee/butter on the skillet and repeat the same procedure to make more. Enjoy the Set Dosa with Vegetable Sagu or ghee or butter.